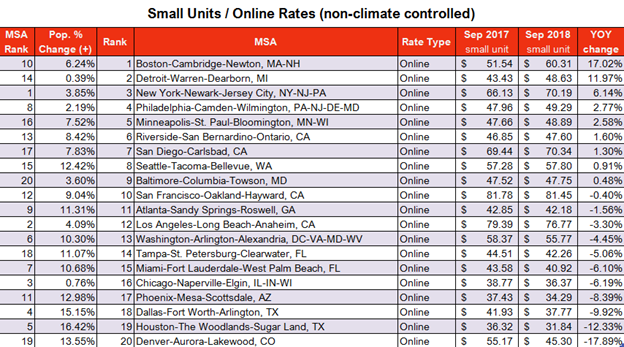 This time last year we took a look at year-on-year rates in the top 20 Metropolitan Service Areas (MSAs) in the USA. We ran a quick comparison of the average rates of small units in September 2016 and compare that with September 2017. This month, we take a look at year-on-year trends, comparing September 2017 and September 2018. Understanding the rate changes in any given area is key for investors and developers, providing them with insights into demand and supply. 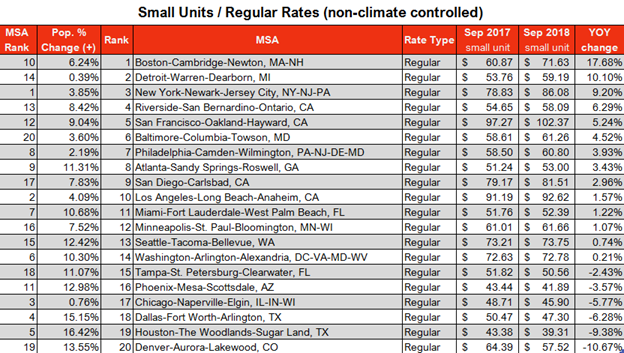 In the last year, the Boston-Cambridge-Newton MSA, the 10th largest MSA in the U.S., saw the biggest year-on-year increase in average small unit rates in September 2018 (compared to the same month last year). At the other end of the spectrum was Denver-Aurora-Lakewood with the largest decrease in average rates on the same month last year. In comparison, our analysis last year showed the Riverside and Chicago MSAs with the biggest increase and decrease, respectively. 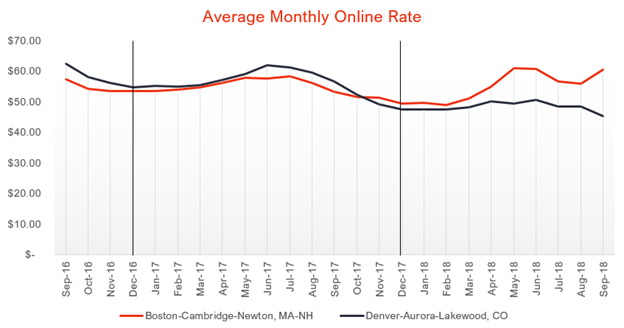 We analyzing the year-on-year average Online rates, the Boston-Cambridge-Newton MSA again showed the highest increase while Denver-Aurora-Lakewood again showed the largest decrease in rates. 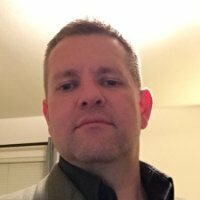 The analysis shows in 2017, non climate-controlled small units in Denver-Aurora-Lakewood, on average, were about one percent more expensive than the units in Boston-Cambridge-Newton. However, in 2018, the average rates for these units are up almost 9 percent in Boston-Cambridge-Newton compared to rates in Denver-Aurora-Lakewood. The recent volatility in pricing in the Boston-Cambridge-Newton area shows storage owners and operators likely increasing rates due to increased demand. For investors looking at new locations, knowing how rates trend over time is just part of the bigger picture. Inventory activity, pricing volatility, merger and acquisition activity, demographic changes and other factors will provide a clearer picture of demand and supply in the market. StorTrack’s Online PLUS subscription, which now includes the powerful SiteFinder mapping tools, provides you with very detailed insights into any market you are currently researching for investment.